Come see our dragon mural at 10th & Jackson in Oakland’s Chinatown. 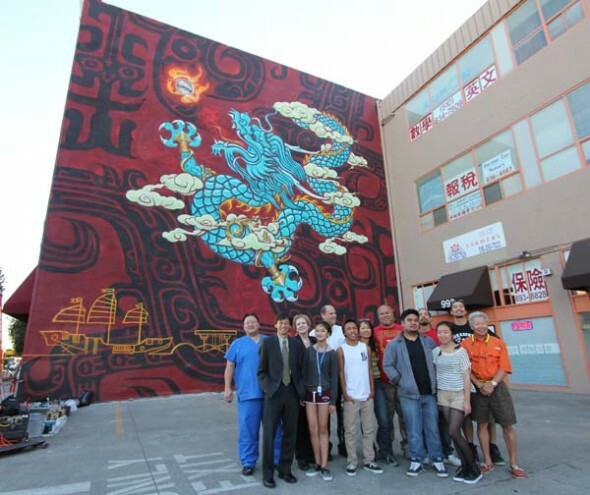 This mural project was started by Lailan Huen and designed by Thomas Wong. The artist team of Thomas Wong, John Hina (of 808 Urban), Jose Garcia (Peps), Sylvia La, and youth from AYPAL gathered with community members and local business owners on the last day of painting in October, for a commemorative photo. Read Oakland Local’s backstory on the mural.